Our History Started 125 Years Ago. For many, Harcourts is a name filled with history and yet for others it is a name synonymous with the future. This is the story of a great New Zealand company - where it came from and where it is headed. This is the story of Harcourts. John Bateman Harcourt was a visionary; a man who redefined the real estate industry and created a part of New Zealand history. Born in England and having lived in Melbourne since 1856, JB Harcourt arrived in, what had recently become New Zealand's capital city, Wellington, at the ripe old age of 21. 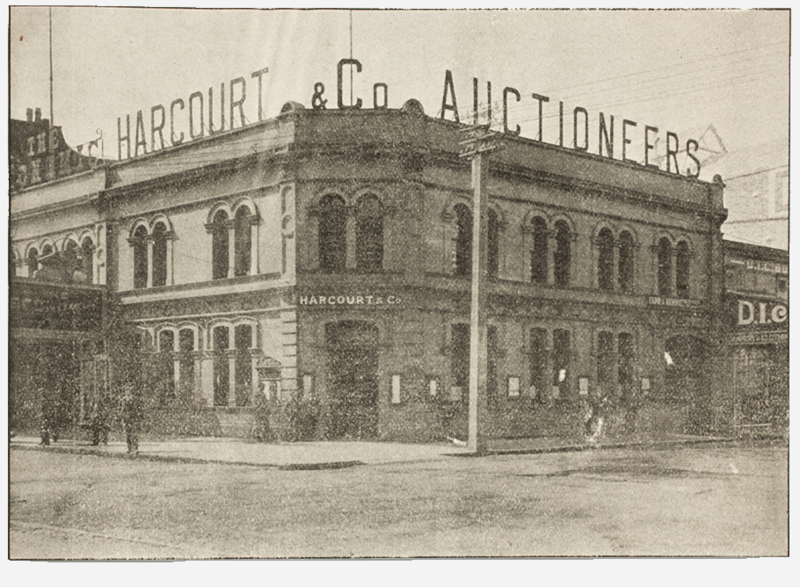 He worked for AP Stuart and Co before purchasing the soft goods business in 1879 and renaming it 'Harcourt & Co.' In 1888, JB transferred all his attention and energy (of which he had plenty) to an exciting new business in property services and so began the Harcourts that we all know and appreciate today. JB clearly had a sharp entrepreneurial instinct and driven by a boldness that enabled him to overcome obstacles and conventions alike, he quickly established Harcourt & Co as one of the best known businesses in the region. From day one of Harcourt & Co opening their doors as a land and estate agency, the company flourished. It quickly established itself as an expert in the sale of not only city property, but also country, seaside, mining, farms and station properties and was recognised as having a strong auction presence. With the introduction of "The Register and Property Investors Guide", the equivalent of today's BlueBook, Harcourt & Co published and circulated an impressive 4000 copies throughout Wellington, on the last Saturday of each and every month. Its success and progress, as a company, grew in line with Wellington's development. Life doesn't always go according to plan though and just one year after Harcourt & Co opened their doors they were caught up in a scandal that has been described as 'the most dramatic auction' in its history. Headlines of 'A Sensational Shooting Case' and 'Attempted Murder in Harcourt & Co's Auction Mart' tell the story of a woman, described as 'particularly excitable and passionate', entering the auctions rooms and proceeding to shoot a builder, Mr Norbury, her husband had a dispute with at the time. Thankfully Mr Norbury recovered and the woman and her husband were arrested. And they think that auctions in this day and age are exciting! JB Harcourt was a man well ahead of his time, who was generous with both his business acumen and money, but also a committed family man. Having married Harriet Wallace shortly after his arrival in Wellington, they set up home in a property on Hawkestone Crescent. This home quickly became the site of many special occasions, as he became one of Wellington's most prominent and respected citizens. Sadly the house is no longer standing, but JB's legacy continued within his children including his sons, Stanton and Gordon, who went on to join their father in the company. In 1905 Stanton joined the family business and Gordon, upon his return from war, also joined them as Harcourt & Co went from strength to strength. It is testament to JB's work ethic and commitment to excellence that very little was done in Wellington's business circle or community without his involvement. Having been a member of the Chamber of Commerce since 1884 (a position he held for over 25 years), he was also a City Councillor for three terms, a director of several companies and the President of the Wellington Racing Club for a record 26 years. JB was a man who never owned a racehorse and wasn't even a punter - instead he was a man who loved the administration and the business side of the club and he is widely recognised as being instrumental in the club's success. In 1928 JB Harcourt passed away but right to the very end he was recognised as one of Wellington's best-known citizens and acknowledged for his part in the evolution of Wellington. His obituary refers to him as 'one of the city's pioneers' and just one month before his passing, he was made a life member of the Chamber of Commerce, a prestigious honour recognising his influence in shaping the region's infrastructure. Sadly, without JB around, Stanton and Gordon did not always see eye to eye and in 1929 Gordon ended up heading out on his own establishing Gordon Harcourt Ltd.
Harcourt & Co still continued as a family run business, with Stanton at the helm ably assisted by his two sons. Neither remained with the company for long, leaving Stanton as the last of the Harcourt family to run the company. There is no doubt that Stanton had a stern disposition, not dissimilar to his father, but also, like his father, he was a prominent member of Wellington society. Stanton was the first of three Harcourts to serve as the President of the Real Estate Institute of New Zealand (REINZ), followed by his brother Gordon and then his nephew Ted. Shortly after going into partnership with Hec Fisher in the 1950's, Stanton chose to retire. Hec had already been with the company for 30 or so years and had learnt to deal with Stanton's somewhat rigid and uncompromising approach to business. Hec, who took sole charge of Harcourt & Co following Stanton's retirement, was a large contributor to the establishment of the Real Estate Agents Act and was in charge until his son Robert took over as Managing Director in 1968. Roger Whyte, who had previously worked for Gordon Harcourt Ltd, then joined Robert and together they built upon both the residential and commercial sides of the real estate business. Harcourt & Co continued to be a proud Wellington company right up until 1980 when it expanded into Auckland amidst plans to list on the Stock Exchange. In 1985 Collins Real Estate, a company founded in 1972 with an emphasis on marketing, training and technology previously unseen in New Zealand real estate merged with Harcourt & Co to create Harcourts Real Estate Ltd. The new company quickly became the major force in Christchurch real estate and made the number one spot it's own as 'the house-sold name'. The merger effectively formed one of the largest real estate companies in the country and, according to Stephen Collins, then Managing Director, illustrated an increase in client expectations for a wider range of services at the time. Stephen is without doubt a man who exemplifies the meaning of customer service. His commitment to Harcourts is legendary and he is well respected within the real estate industry. Collins Real Estate held the largest market share in Christchurch when they merged with Harcourts. In 1988, celebrating 100 years in business, Stephen introduced the current franchise model and then set Harcourts up as a publicly listed company. One of the very first shareholders of substance was the National Bank of New Zealand, who continued to purchase shares within the company culminating in a return to private ownership. Just one short year later Tower Corporation took the plunge and purchased the shares from the National Bank. Stephen then, in 1992, conducted a management buyout with the aim of creating more of an industry-led company. After six extensive months of negotiation Stephen, together with his management group made up of Paul Wright, Bob Cooper and Jo-Anne Clifford, were the proud owners of Harcourts. As current Chairman of Harcourts International Ltd, his contribution to the Harcourts name continues to this day. The management team went from strength to strength and Harcourts' presence across New Zealand grew immeasurably. In 1993, Paul Wright was promoted from his role as South Island Regional Manager to General Manager and was instrumental in the growth and ethos of the company. He is a truly exceptional individual, who can be relied upon to build relationships and achieve successful outcomes, a great thinker and a person who gets things done. He is, without a shadow of a doubt, recognised as one of the single most important people in Harcourts' journey to date. Without Mike's vision and determination, Harcourts would not be the company it is today. Mike continues to define an industry, showing the determination and dedication necessary to create his own unique place in Harcourts' history. Harcourts continued to diligently set up branches across New Zealand, all the while having its sights firmly set on the Australian market aswell. In 1997, the dream became reality as Mike Green, former franchise owner, headed across the ditch to spearhead the 'Harcourts-isation' of Australia. Over the course of a few years, the big blue signs went up in all six Australian states and Harcourts became the fastest growing real estate company in Australasia. With a background in all areas of the company to his current role as Managing Director Mike is, quite simply put, the past, the present and the future of Harcourts. Since Mike and Paul took over the reins in 1999, Harcourts has expanded even further with more than 800 offices now in Fiji, China, Hong Kong, Botswana, Zambia, South Africa, Indonesia and the United States. As a company, Harcourts has always honoured success and each and every milestone reached was celebrated. In 2000, the prestigious Harcourts Hall of Fame was introduced to acknowledge the extraordinary contribution certain people had made to the successes, growth and stability of the Harcourts brand. Each year new members are inducted into this elite group of people. While Harcourts is quick to recognise and applaud success within the group, they themselves have been honoured for exceptional success and achievement on an international basis. In 2003, not only was Mike Green honoured by being invited to join the New Zealand Business Roundtable, New Zealand's leading business organisation, but Harcourts was accepted as a member of the Leading Real Estate Companies of the World network. It's not just people who make a difference in the real estate industry though. At Harcourts, it's also about the services and tools that are provided to each and every client. Harcourts takes pride in the fact that innovation and technology are a major focus of theirs - it is one of their very real points of difference. In 1996 that innovation in technology led to Harcourts launching the very first public searchable property database on the internet. Some 17 years on www.harcourts.co.nz continues to be ranked as the most visited real estate group website in New Zealand. You don't get recognised for doing an average job - you get recognised by doing the very best job, by planning, creating and implementing excellence in everything you do. With this in mind, in 2002 Harcourts launched The Academy, a training academy providing courses for sales, management and administration to ensure that the Harcourts team received the best possible training. The Academy, headed by Irene Green, has fast become recognised as setting the benchmark for the entire real estate industry and has now achieved RTO (Registered Training Organisation) status allowing industry licensing to all Harcourts people attending the Academy programmes. Harcourts continues to be the only real estate group in New Zealand to provide such extensive in-house training opportunities. Harcourts had realised for some time that in order to provide their clients with exceptional service they had to look at ways of providing more. More than what other real estate companies would offer and more than what clients would generally expect. Harcourts announced full ownership of the mortgage broking company they had been instrumental in setting up back in 1997. Mortgage Express Ltd now has a client database sourced solely from recommendations through Harcourts and repeat business and, having recently settled over $100 million in just one month, is going from strength to strength. In the spirit of providing added value, Harcourts also set up their own charitable foundation. 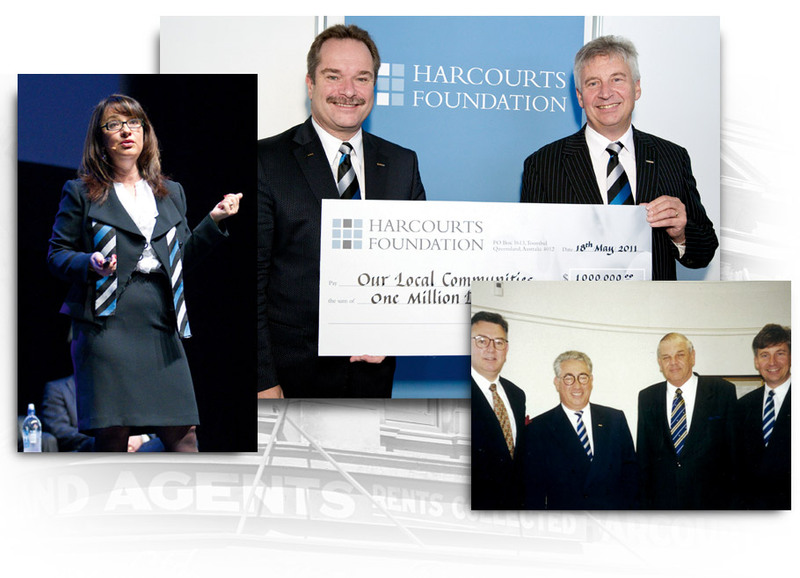 For 125 years Harcourts has enthusiastically supported a myriad of community initiatives and the Harcourts Foundation, introduced in 2008, was set up with the aim 'to provide support that helps, grows and enriches communities'. Since its inception, the Harcourts Foundation has raised more than $1.7million dollars and helped thousands of people through many worthwhile organisations. Being identified as one of the top five real estate brands in the world, by leading world real estate authority Stefan Swanepoel, encouraged Harcourts to strive even more to ensure further growth - and they focussed on growth within the commercial sector. In 2010 Harcourts joined with NAI Global, the fourth largest commercial real estate services group in the world, and NAI Harcourts was born. Launched to meet the needs of property owners, developers and occupiers it has quickly found its place in New Zealand commercial services and continues to gain positive momentum. The more things change, the more they stay the same" could well have been said about Harcourts. While the look of what Harcourts does has certainly changed over the years, with both the logo and, flagship magazine, the Bluebook evolving through the ages, there are also certain things that will never change. The Harcourts brand has always stood for dependability, quality, professionalism and has become known for the exceptional service and commitment provided to clients. Harcourts not only sells more than 1 in every 5 homes in New Zealand, it has also been consistently recognised over the years as New Zealand's most preferred real estate group and the real estate group with the top of mind awareness in AC Nielsen research. Harcourts, New Zealand's largest real estate group, is proud to be the brand of choice for the tens of thousands of New Zealander's who put their trust in them each and every day. So, as Harcourts' journey continues, we look back proudly at the people who helped us along the road, the milestones that we met and celebrated, the records that we broke, the ideas that became reality and the family that we created. "It's quite exciting to have reached this remarkable milestone" said Managing Director, Mike Green. "We owe our many years of success to generations of amazing people who were committed to this great organisation, who led by example, focussed on great service and weren't afraid to take a leap of faith. This company is all about its people, its values and its beliefs and I cannot tell you how extremely proud I am to be leading the company into another extraordinary 125 years of business." Copyright © 2013 Ed Johnson. All rights reserved.